The Milford Person Lift is an ideal wheelchair to car transfer solution for someone with a disability or reduced mobility. It offers simple transfer from wheelchair to car at a great saving when compared to a complete wheelchair van. Not only is the Milford Person Lift a cost effect wheelchair transfer solution, it’s also incredibly safe. 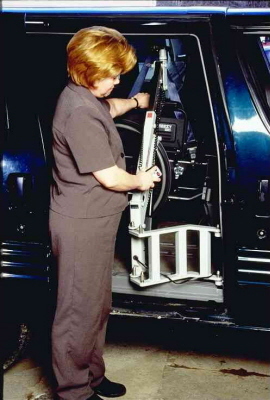 This safety is due to the Milford Person Lift's ability to transfer a person into a regular auto seat, rather than into the back of an adapted van. This means that you take full advantage of the autos in built safety features such as air bags, locking seatbelts and regular automotive seats. If you want to take advantage of the Milford's great features, inquire today for a fast response. If you’re like a lot of people with reduced mobility, you were sorry to see your beloved and cost-effective car go when you couldn’t make the transfer any more. But with the Multi-Lift, cars are back! 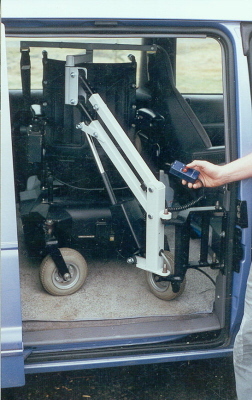 Using the portable Multi-Lift and a mounting bracket in your car, you can get in and out again. 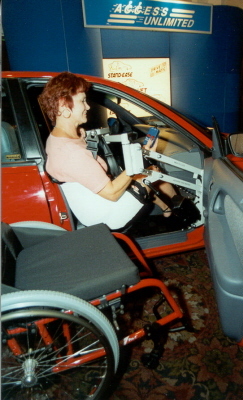 The Multi-Lift is available with a wide variety of slings, so people with every level of disability can get in and out of the car. And the Multi-Lift fits in every car on the market!